Does anyone know on the snap website where to see a full list of extra charges? Have you spoken with SNAP about your speed issue? not sure about the plan change, i have only ever moved data cap plans, which does have its querks in snaps system, but it somewhat makes sense. - for this, within 5 mins of noticing something didnt go down quite how we wanted it to, snaps billing had answered my call, and explained how the process works, and why it wasnt making sense. 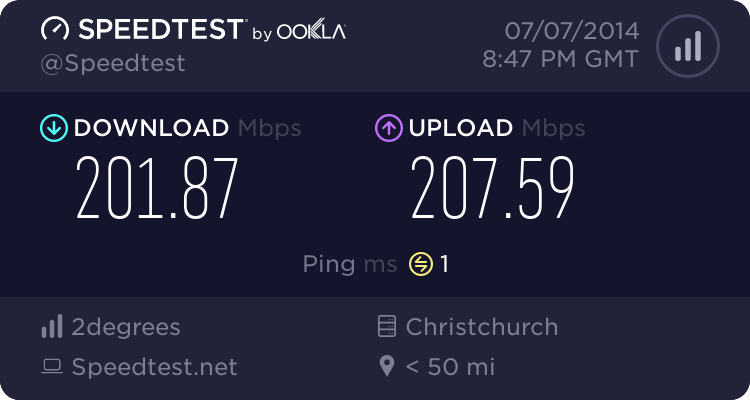 There can be provisioning issues that prevents you getting the full speed you've paid for, and you have to try different servers - eg Telecom NZ Wellington, Snap Chch. If you're not getting within 20% of advertised speed call Snap to have it addressed. hio77: not sure about the plan change, i have only ever moved data cap plans, which does have its querks in snaps system, but it somewhat makes sense. - for this, within 5 mins of noticing something didnt go down quite how we wanted it to, snaps billing had answered my call, and explained how the process works, and why it wasnt making sense. He has the 100/50 plan and is considering the step down as he is not getting the speed he is paying for. Ah. i missread slightly on the speeds. i have seen a few people with international issues on snap UFB, would seem snap are working away on it though. I didn't know about the fee for switching plans when I moved from ADSL to VDSL either. Gave me some bill shock and I'm annoyed about it even now. $35 I didn't know about. Speaking of which I thought national calls (non cell) were free on my VoIP account but I see I'm being charged for them. Are you guys sure these are "fees" and not just oddities in the way snaps billing system seems to work? Like hio77 I noticed this when changing data caps - at first it looks like it's adding an extra charge or double charging you, but when you add it all up it actually works out right. sidefx: Are you guys sure these are "fees" and not just oddities in the way snaps billing system seems to work? Like hio77 I noticed this when changing data caps - at first it looks like it's adding an extra charge or double charging you, but when you add it all up it actually works out right. No. I just rang and Karen the CSR confirms I shouldn't have these call charges. She's sorting it out with a promise to email once it is. They go back a fair way, we just didn't notice because we aren't huge phone users. And I'm miffed at the change of plan fee ($35) because no one told me about it at the time. I've switched plans with ISPs before and never been charged. Additionally when I enquired if I could change plans within Snap in the future without it being a contract issue I was told I could but again no fee was mentioned. I get annoyed about hidden charges. JayADee: No. I just rang and Karen the CSR confirms I shouldn't have these call charges. She's sorting it out with a promise to email once it is. They go back a fair way, we just didn't notice because we aren't huge phone users. Yup. No mention of the courier charge on the router either. In the past, ISPs have just mailed one to me, not charged me shipping. So when you see the bill you end up with the first time, it does come as a shock. Exactly. That was $50. I was not expecting. Add the actual router cost ($50 which the DID tell me) and the first bill on the new plan was over double what I had been paying. Bill shock, I tell ya, especially since I sold the husband on the switch by explaining the value. I like Snap a lot but boy was I not impressed at the shipping and switch fee surprise and as you can see it still rankles many months later.